It is replaced by the Cherry G83-14000. These keyboards are equipped with an integrated fingerprint sensor as well as an optional smart card reader. 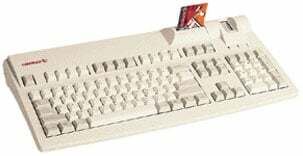 G81-12000 Advanced Keyboard (Full Size, 104 Key, Optical Finger Print Capture Identicator) - Color: Beige 43 Programmable Keys. Full Size, 104 Keys (Microsoft Windows.) Integrated Smart Card Reader/Writer. Integrated Biometrics (Finger Print Scanner). PC/SC Compliant. Wouldn't it be good if your G81-12000 could recognize you by your fingerprint - like our Personal ID Keyboard for fast, easy and secure log-on. The integrated optical sensor makes it possible. This keyboard is also available with smart card reader on request. This allows you to implement further security functions.